You've already settled on ham as the main course for your next big dinner event, but side dish options are almost too plentiful. And then there's dessert to think about, too. Keep things simple with mashed potatoes or risotto, paired with a side of fruit salad. Round things off with cheesecake, fruit pie, cake or sorbet as a sweet finish to a heavenly ham dinner. 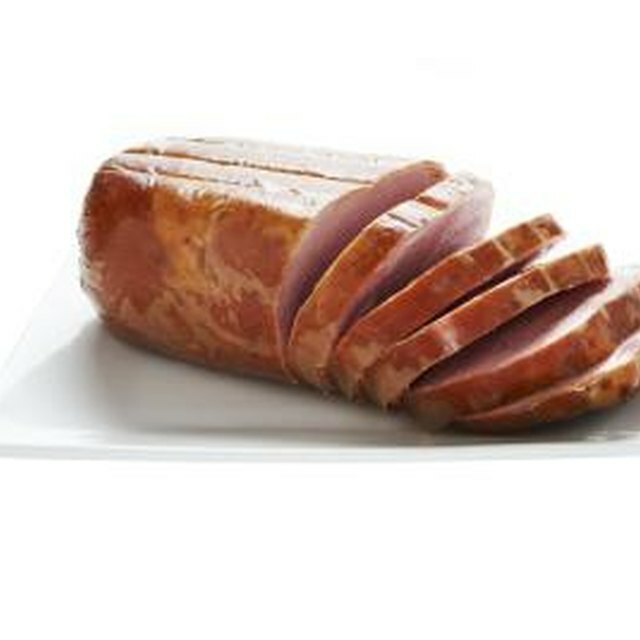 The centerpiece of dinner, the ham, can be cooked a number of ways, but is usually baked whole. It can also be cooked in a slow cooker or sliced and grilled. Glazes add flavor to whole hams. Popular glazes include crushed cherries and mustard. Less common glazes include peanut butter, chipotle, horseradish or marmalade. A little sweetener, whether from sugar, syrup or honey, is the secret to a successful glaze. Ham can also be cooked with a spice rub or crust, or with cloves and pineapple rings. Score the skin of the ham so the glaze can penetrate the meat. Mashed potatoes are a common side dish with ham, but rice is also a good alternative. For example, pair chipotle-glazed ham with Spanish rice. Mashed potatoes mixed with buttermilk ranch dressing, scalloped potatoes and baked potatoes are also great additions to a ham dinner. For something different, try replacing the white potatoes with sweet potatoes, and serve mashed or baked sweet potatoes. Wild rice, steamed white rice, pilaf and risotto also work well with baked or grilled ham. Vegetables and salads make perfect side dishes for a ham dinner. A fruit salad, such as an orange and honey salad, helps balance the salty flavor of the meat. Vegetable dishes that pair well with ham include asparagus cooked with Parmesan, fresh steamed green beans topped with crushed nuts and crunchy salad toppings, sauteed tomatoes and squash, or creamed pearl onions flavored with bacon. Other simple side dishes include corn with butter, steamed peas, dinner rolls, cornbread stuffing, baked beans or macaroni and cheese. Just about any dessert works well on a ham dinner menu. Consider a cheesecake, either with toppings, such as cherry or strawberry, or with flavor baked right in such as a chocolate, hazelnut or coffee cheesecake. Fruit pies, lemon meringue pie and cream pies, such as coconut or chocolate cream also pair well. Cakes with tropical flavors, such as coconut cake topped with mango, banana or pineapple, or served with a side of lime sorbet, are also a great way to balance out the salty taste of the meat.